Pastor Roy with my daughter, Jamie, and grandkids. I had a lady tell me the other day that since she’s getting older in life, she just doesn’t feel as useful as she used to feel in her younger days. She said earlier in life she used to volunteer at the church and other organizations and it gave her a sense of worth. Now, with an aching back and not being able to stand for a long period of time, she just can’t find as much to do to give of her time and talents. I can feel her frustration as at times even in my 50’s I get to feeling old and used up. I can only imagine when I get to my 70’s like she is, how it must be. However, I look around and there is another couple in our church who are up in their years and always going and doing for others despite their health limitations. I’ve always told them, “I want to be like you when I grow up!” I tease, but really…I’m serious. My heart’s desire is to serve God fervently for the rest of my days…whatever that might look like. How I serve in my 70’s and 80’s may not look anything like it did in my 20’s or even 50’s, though. However, it is important that we never retire in our service to the Lord. As a matter of fact, as we age, a lot of things we used to do change and evolve as God points us in different directions throughout our lives. In a recent show on PBS, The Truth About Entrepreneurs: Twice As Many Are Over 50 Than Under 25 it really made me think. As these over 50 people gain experience in the marketplace, they often realize a great void in their vocation. Having wisdom from their life experience, they confidently step out, often with their own life savings, to make a difference in their world. I’m full of facts today, but here’s another one. According to an article by Martin Kelly, “The majority of the presidents (of the U.S.) were between the ages of 50 and 59 when they were elected into office. The youngest elected president was John F. Kennedy at age 43. The oldest elected president was Ronald Reagan at age 69.” Again, a story about “world changers” well after 50 years of age. I can’t help but point out, it often seems to be very similar in our spiritual lives. I remember as a new Christian seeking and studying fervently to find out how I could hear God’s voice and know for sure He wanted me to do something. As a 50+ woman today, I just pray and step out doing what I think God is asking me to do. I am confident that if I’m doing the wrong thing, He is going to let me know! He never leaves me out in the cold. I know this as I have learned from my life experiences. 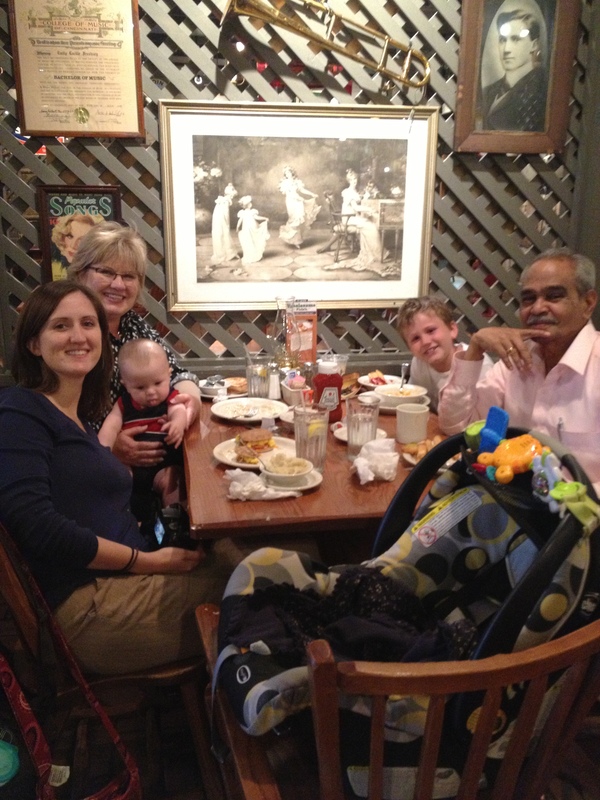 Last night my daughter and I went to dinner with a good friend from India and one of the Godliest men I know. We met Pastor Roy when we went on a mission trip to India and have stayed in contact for over 13 years watching his ministry grow and sometimes struggle, as he obediently follows God’s lead in his daily journeys. He is an amazing man that when I met him had planted about 5 churches in his country. Today he has 11. He also oversees a home for young girls that have been rejected or whose parents can no longer take care of them. He even organized a helping ministry for widows as a result of seeing the need they had after the tsunami several years ago. The amazing thing is, Pastor Roy didn’t even know and accept the Lord as his Savior until he was 48 years old! At a time when some are winding down and planning for retirement in 20 years, he was just beginning. At the age of 84, he is still hearing God’s call and moving forward! I want to be like him when I grow up, don’t you? We all want to feel as though we have worth. I can’t think of anything that gives a person more worth in this life as when they are serving the Lord. Whether it is a phone call, a note to a friend, praying for someone, leading worship, writing a blog, an encouraging word, organizing a small group, planting a church or whatever God has asked you to do…it has worth. As what we do in this life for the Kingdom will be the only thing that matters when our life here is done. What is God asking you to do today? Are you feeling afraid or not equipped for the task? Remember…He is the One Who will supply all of your needs. Pray for the Holy Spirit to give you guidance and wisdom as you step out into your world to make a difference. Joshua 1:9 (NKJV) …Be strong and of good courage; do not be afraid, nor be dismayed, for the Lord your God is with you wherever you go. Philippians 1:9-11 (NKJV) And this I pray, that your love may abound still more and more in knowledge and all discernment, that you may approve the things that are excellent, that you may be sincere and without offense till the day of Christ, being filled with the fruits of righteousness which are by Jesus Christ, to the glory and praise of God. Previous She Was Lost, But Has Now Been Found! Next Let Me Tell You About My Ah-Ha Moment! Very good, Lori. I LOVE this perspective since I’m somewhat over 50. I wrote my first book over the past years, started blogging a year and a half ago, and I look forward to new and different service in the years to come. The seasons of life change us, but we aren’t less than what we were. Maybe there’s an even advantage in experience. Thank you! Thanks, LouAnn! It’s wonderful to know that God can still use us no matter where we are in life! Thanks for reading and for your kind response! Lori, I will send you an email of how this spoke to me. It brought to mind how God spoke to me through a CWC speaker this summer. I’m sure that God has spoken to the hearts of many women when you speak. As it says in Joshua 1:9,……. for the Lord is God is with you wherever you go……. Lori, may you feel His comforting and strengthening Presence today. Thanks, Mary Lou. Thanks for your encouragement, too. It’s always nice to know God is using what I write for Him! Hi Lori! What a great reflection on working into our years. I am sure that so many people wonder if they should start any ministry, because maybe they think they are too old? But your friend is a wonderful example that God uses everyone and does not age discriminate. Thanks, Ceil! God doesn’t discriminate, that’s for sure! I am thinking that’s a good thing, too! Have a great week and thanks for reading!